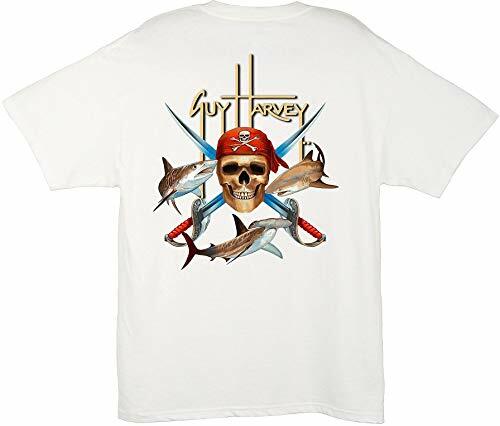 GUY HARVEY SAILFISH PRO UVX PERFORMANCE T-SHIRT The new Ultra Pro UVX series of Guy Harvey performance t-shirts bring sun protection to a whole new level of comfort and performance. Sailfish LS Ultra Pro UVX blocks 96% of UV Rays, wicks moisture to keep you dry, anti-microbial, and super soft hand. 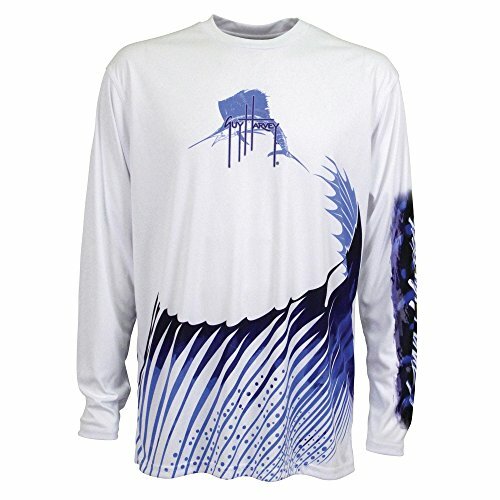 FEATURES100% polyester performance fishing shirt blocks 96% harmful UV rays quick dry moisture wicking sublimated Guy Harvey art UPF 30+ anti-microbial long-sleeve non-pocketed HOW IT WORKS This comfortable Guy Harvey Sailfish Pro UVX Performance Long Sleeve Shirt features a moisture management technology that wicks moisture away while providing odor control. The fabric provides a UPF Sun Protection Rating of 30+ and is breathable by moving perspiration from the skin to the outside of the fabric for rapid evaporation. As moisture is produced by the body it moves through the hydrophobic layer of fabric which acts as a pump to move the moisture to the outer surface. This synthetic fabric is light breathable and durable. 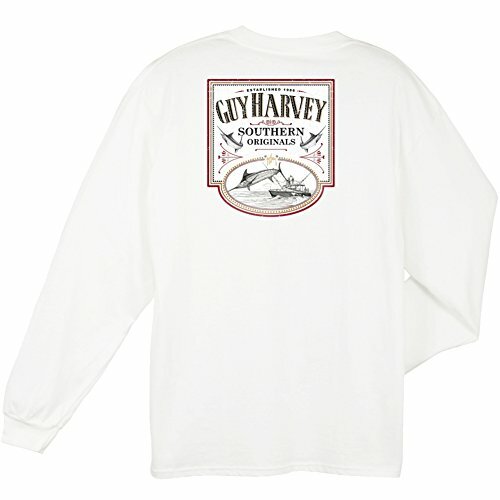 GUY HARVEY MARLIN PRO UVX PERFORMANCE T-SHIRT The new Ultra Pro UVX series of Guy Harvey performance t-shirts bring sun protection to a whole new level of comfort and performance. MARLIN LS Ultra Pro UVX blocks 96% of UV Rays, wicks moisture to keep you dry, anti-microbial, and super soft hand. 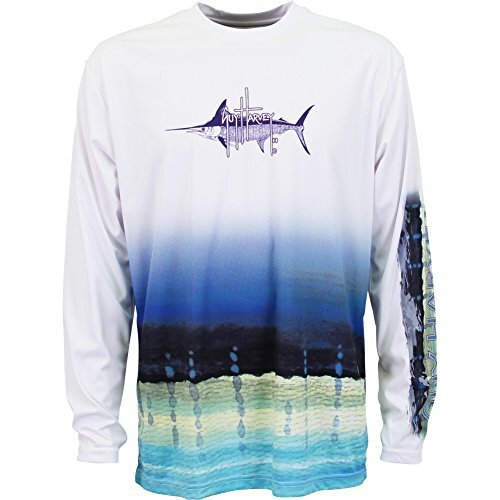 FEATURES100% polyester performance fishing shirt blocks 96% harmful UV rays quick dry moisture wicking sublimated Guy Harvey art anti-microbial long-sleeve non-pocketed HOW IT WORKS This comfortable Guy Harvey Marlin Pro UVX Performance Long Sleeve Shirt features a moisture management technology that wicks moisture away while providing odor control. The fabric provides sun protection and is breathable by moving perspiration from the skin to the outside of the fabric for rapid evaporation. As moisture is produced by the body it moves through the hydrophobic layer of fabric which acts as a pump to move the moisture to the outer surface. This synthetic fabric is light breathable and durable. 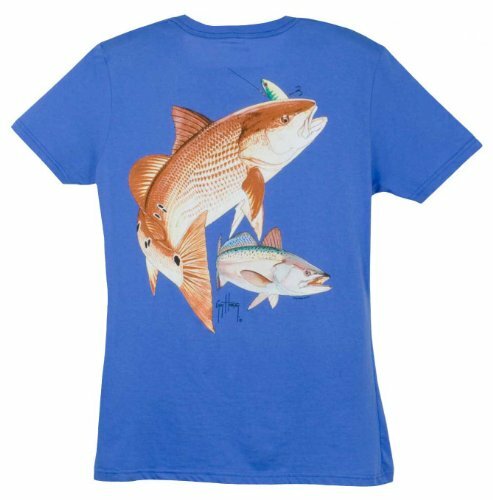 GUY HARVEY REDFISH PRO UVX PERFORMANCE T-SHIRT The new Ultra Pro UVX series of Guy Harvey performance t-shirts bring sun protection to a whole new level of comfort and performance. REDFISH LS Ultra Pro UVX blocks 96% of UV Rays, wicks moisture to keep you dry, anti-microbial, and super soft hand. 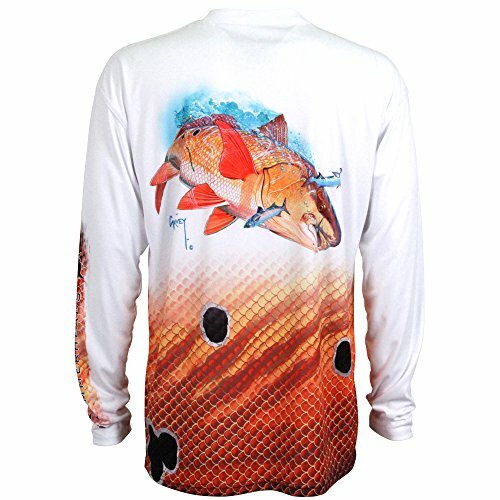 FEATURES100% polyester performance fishing shirt blocks 96% harmful UV rays quick dry moisture wicking sublimated Guy Harvey art UPF 30+ anti-microbial long-sleeve non-pocketed HOW IT WORKS This comfortable Guy Harvey Redfish Pro UVX Performance Long Sleeve Shirt features a moisture management technology that wicks moisture away while providing odor control. The fabric provides a UPF Sun Protection Rating of 30+ and is breathable by moving perspiration from the skin to the outside of the fabric for rapid evaporation. As moisture is produced by the body it moves through the hydrophobic layer of fabric which acts as a pump to move the moisture to the outer surface. This synthetic fabric is light breathable and durable. The Guy Harvey lifestyle is synonymous with not only trophy gamefish, but the other animals that reside in the waterways. 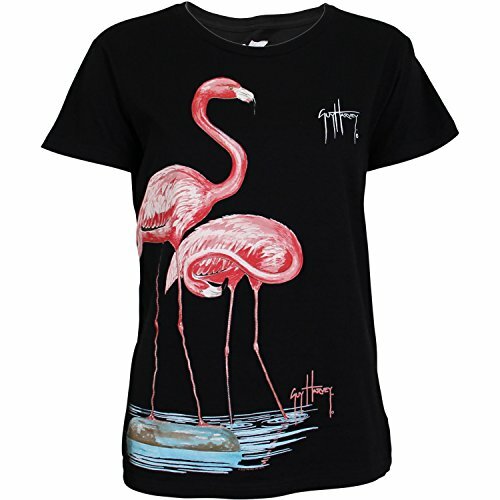 The new two falmingos t-shirt from Guy Harvey features stunning artwork of two bright flamingos on the sea shore. 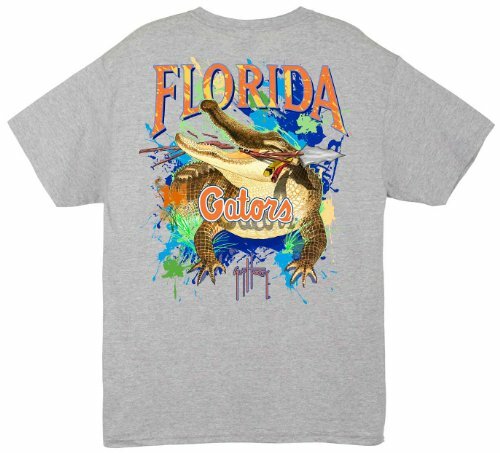 Rep your Gator pride with this University of Florida graphic tee from Guy Harvey. Florida fans, students, and alumni will be proud to wear this one. It doesn't get much better than a Gator chowing down on his favorite snack for all to see! The redfish and seatrout are two very popular inshore saltwater fish prized by anglers along the south east and gulf coasts. As is the case with all Guy Harvey sportswear, your purchase of this Guy Harvey hat will contribute to the over $200,000 AFTCO donates each year to the Guy Harvey Ocean Foundation. 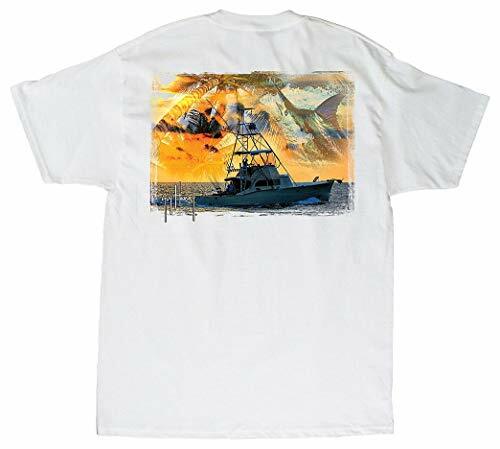 Guy Harvey features his award winning marine artwork on the back of this tee. This T-shirt features short sleeves, a crew neckline, and a screen printed fish & boat graphic on the back. 100% Cotton. 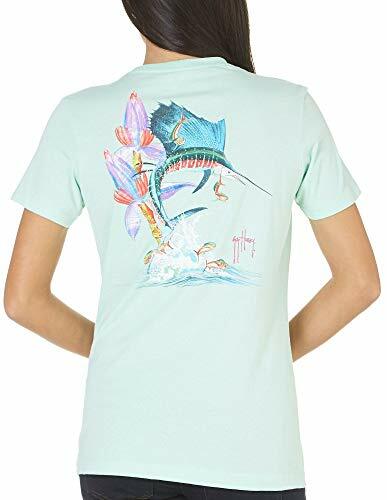 The new Guy Harvey LTH4 series of ladies t-shirts features a lightweight and comfortable 4.3oz 100% combed cotton crewneck t-shirt. Sailfish Launch design features a leaping Sailfish ripping through a school of Dorado on the surface with a floral backgrop.